Welcome new customers of OhainWEB.com. If you are a returning customer, welcome back to our Client Documentation pages. 1. The GETTING STARTED page will tell us what we need from you right at the start to get a feel for your needs and to help us scope out the extant of a website to fill those needs. A great way to welcome new customers. 2. Please complete the QUESTIONAIRE as soon as you possibly can. This will make up the baseline from which we will develop your website. We can change the baseline from time-to-time as needed, but when we are done, we will measure the finished product against this baseline to see how we delivered. 3. Read the page GET THE WORD OUT and start preparing to do this. Also check out the SEO page in parallel. Both of these provide a great welcome to new customers and help them understand what their website is all about. 4. 20 STEPS will show you our checklist as we develop your website and the checklist we use later on to make sure all has been done for you. OhainWEB.com recommends that our clients have a set of “Terms & Conditions of Use” documents posted on their website. This is not always essential for all type of websites, but we do recommend it for all, as a basic part of your CYA strategy. These documents advise the user that if there are any complaints to be made to address them to “ComplaintsOfficer@OhainWEB.com”. This is an email box that is daily monitored by OhainWEB.com. We strongly believe that T&C of Use documents belong on a website as a basic protective pro-active approach to users that might be offended. As a service for our Web Design and Hosting clients, we offer to share these documents with you for your website (for a setup fee). If you chose to share these disclaimers on your own website, any complaints would go to the same email address which we monitor – and we would notify you. If we should make changes to our documents, those same changes are made to yours if you use our services. THIS IS NOT TO BE CONSIDEERED AS LEGAL ADVICE, IF YOU HAVE ANY QUESTIONS YOU SHOULD SEEK COUNSEL FROM YOUR OWN LEGAL SOURCES. Professional world-class service at reasonable Southeast Texas prices. Browse our Web site for more information about Ohain. Click below to see members of our external resources support team. 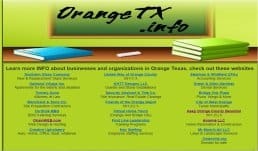 OhainWEB has been serving the SETX community since 2005. We specialize in websites - with a strong emphasis on business planning and marketing. Good web design upfront is key to your success on the Internet. Or Use Your PayPal Account.